Fiber Optic cable can carry a wide range of data services, including real-time interactive video. They have many advantages over copper cables because of its high bandwidth and because it is impervious to EMI and crosstalk. 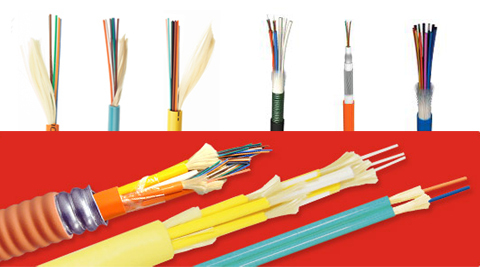 Fiber optic cable consists of of optical fibers, other internal parts like buffer tubes, ripcords, stiffeners, strength members all included inside an outer protective covering called the jacket. Fiber optic cable comes in lots of different types, depending on the number of fibers and how and where it will be installed. It is important to choose cable carefully as the choice will affect how easy the cable is to install, splice or terminate and what it will cost. Fiber optic cable available with various grades of multimode (OM1, OM2, OM3 and OM4) and singlemode fiber (OS1 and OS2). Multimode optical fiber is generally used for campus or intrabuilding applications due to the ability to use cost-effective transceivers. Singlemode optical fibers are used for extended distance applications and for high-speed applications.